Castelnuovo-Tedesco was born a decade behind the “Generazione degli Ottanta” (“Generation of the 1880s”) – Respighi, Casella, Pizzetti and Malipiero. This was the group that began to provide an Italian tradition of purely orchestral and chamber music, as opposed to a focus purely on opera. He would be taught by Pizzetti and influenced by Casella, himself an eclectic composer who absorbed widely contrasting influences from Ravel to Schoenberg. A composer of some versatility, initially concentrating primarily on small forms, he turned to works for larger forces after 1920. In his later career he composed a lot of film music. That he achieved fame and success relatively early was down both to his skill and to the support of Casella and the Società Nazionale di Musica Moderna. In spite of this support he was, in fact, much less of a “modernist” than either Casella or Pizzetti. His relaxed and highly accessible compositional style is rather what one might expect of a conservative late-romantic who was, apparently, very unsympathetic to serialism. Many of his early compositions figured prominently in the programs of Italian and other European orchestras and performing ensembles between the two world wars and his music received considerable interest from across the Atlantic. Jascha Heifetz played his first violin concerto (of 1924) in New York in 1930 and commissioned the second – which was premiered in 1933. The contacts the composer built up during this period were of great value to him when, being Jewish, he was forced to flee his native Italy in 1939. He emigrated to the US and ended up in Hollywood - helped by both Toscanini and Heifetz, who established contacts for him at MGM. He subsequently went on to compose much film music and also to teach at the Los Angeles Conservatory of Music where his pupils included talents no less than André Previn, Henry Mancini, Jerry Goldsmith and John Williams. He left a large catalogue of works and quite a lot has been recorded, particularly during the last few years. Discs of his two piano concertos and the two violin concertos appeared recently and were well-received. The body of his chamber music includes a lovely guitar quintet, Op 143 (a favourite of mine over many years) two piano trios, three string quartets – as yet unrecorded - and a violin sonata. CPO have now put us in their debt by making the two delightful piano quintets available. The first quintet, according to the booklet, has no opus number and dates from 1932. However, a recent Albany release - which I haven’t yet heard - coupling this work with the first piano trio (Op. 49) identifies the opus number as 69 and suggests that the work dates from 1934. Either way, stylistically, it has little in common with the contemporaneous Second Violin Concerto (Op. 66) and is somewhat less immediately memorable, although the themes do repay repeated listening. The second movement is a minor key Adagio with a lovely cello tune. The third movement - a restless, post-Mendelssohnian scherzo - is probably the most interesting. I thought I detected some oriental touches in the fourth movement. The musical language barely changes between the two quintets although the sunny second quintet, the composer’s Op.155, dates from 1951. It is entitled “Memories of the Tuscan Countryside” – possibly reflecting the composer’s nostalgia for his homeland, although the whole work is far from sentimental. Movements are entitled “The Hills”, “The Cypresses”, “Procession in the month of May” and “The Harvest”. Stylistically it is slightly more varied than the first quintet. The third movement trots along with what appear to be allusions, appropriately enough, to the song: “You are my sunshine” (first recorded in 1939). Castelnuovo-Tedesco’s idiom is recognisably south–European but without the nationalistic traits of, say, Rózsa’s 1928 piano quintet or the gritty tension of Bloch’s first piano quintet of 1923. “Mediterranean” probably captures it as well as any description and I thought there were occasional hints in the first quintet of the Ravel piano trio – possibly a legacy of Casella’s influence. 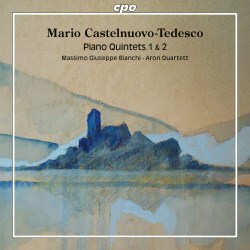 The two quintets have little in common with Respighi’s quintet of 1902 (review ~ review) but there are – perhaps not surprisingly - very considerable stylistic similarities with both the quintets of Pilati (1927-8) and Longo (1934) that appeared on an interesting Naxos disc a year or two ago. That will not place the music for those readers unfamiliar with such rarities so it might be more helpful to point to similarities with the idiom - if not the length - of the sprawling Op. 51 quintet of Schmitt (1902-8) and the short quintet of Granados (1898) - but the closest parallel is probably with Pierné’s Op. 41 quintet (1916/17). The performances are very accomplished and the CPO recordings are decent. The sound of both quintets has a pleasant bloom but the musicians seem to be slightly more tightly gathered around the piano in the first piece. The stereo image is not very wide, which is emphasised when the piano is pitted against unison strings. The recording of the second quintet is slightly drier and there is a wider sound-stage, which helps. There is an audible edit (silence) at 9:25 in track 6 but that is only momentary. The booklet is in German, English and Italian and, being rather laboriously translated, it does not make compelling reading. Overall these two quintets are not exactly masterpieces but the music is very enjoyable and this is a worthwhile release to which I shall return with much pleasure. I hope that CPO or Naxos will investigate the string quartets in due course.